Tron (TRX) Now Listed on Faast! 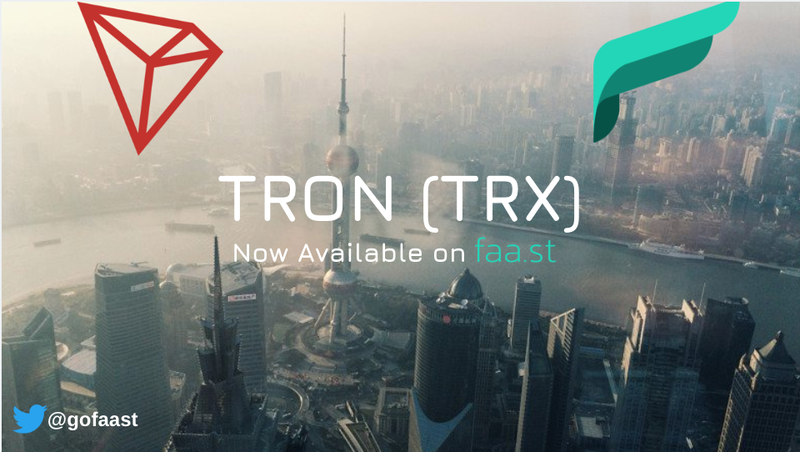 Today we are pleased to announce that TRON (TRX) is now available on Faast! As we stated in last week’s blog post, a critical part of this next step in the evolution of Faast is adding support for important tokens which have migrated off the ERC20 standard and onto their own blockchains. One of the most ambitious projects that made this move over the past year is TRON. The bull market of 2017 is a pleasant but distant memory, and many tokens which experienced a surge in value during that time have since crashed and burned. But Tronix (TRX), the native currency of the TRON network, has shown amazing resilience, remaining one of the top 10 cryptocurrencies by market capitalization for most of that time. The recent market downturn has not caused the team to scale back their ambitions. If anything , TRON has only become bigger and bolder since last year, with a main net launch, acquisitions of companies like BitTorrent, and more. So what are the people behind TRX trying to achieve? If you already have a TRX wallet set up, go to https://faa.st/app/swap and enter your TRX receiving address, as well as how much of the other asset you wish to swap. Check the box to accept the Terms & Conditions, and click “Create Swap”. And that’s it! TRX will be delivered to your wallet just like that. This is the simplest way to use Faast if you already have a dedicated TRX wallet that you like to use. Can I use Faast with my Ledger wallet to get TRX? At this time, the Ledger API does not yet support TRX. When it is fully ready, we’ll make an announcement here. In the meantime, try out the Swap page to familiarize yourself with the Faast UI. Did you find this article helpful? Then be sure to click the subscribe button above to get all the latest updates delivered to your feed each week! Visit https://faa.st/ today and subscribe to our newsletter for key industry and market insights, updates to the Faast ecosystem and more!